Perhaps you are a tad perplexed by that little paragraph of information up there. “A.A. Milne? Author of a mystery?” Yes, surprisingly enough, he was! Although, if you are a fan of his Winnie the Pooh stories, you won’t be surprised to hear what a splendid book this is. 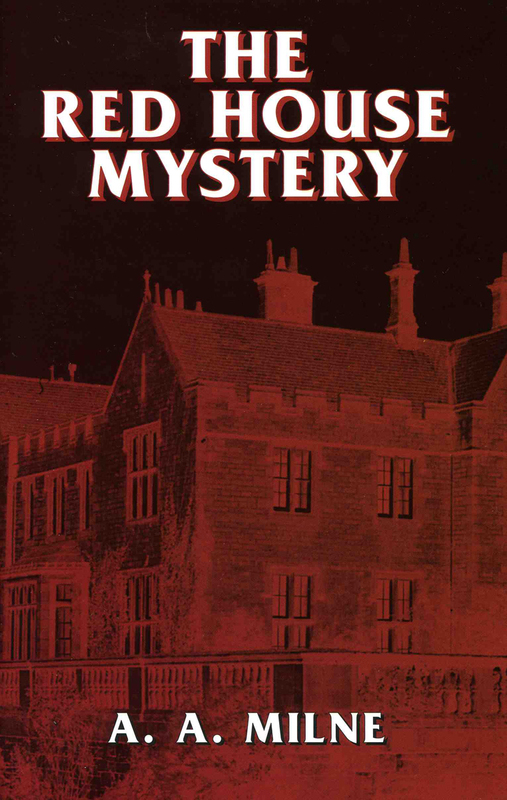 The Red House Mystery is the perfect English Country mystery tale. Centering around the country estate of a pompous man who mysteriously disappears in suspicious circumstances, the story is fast paced and lively. Milne’s amateur detective, Antony Gillingham, becomes entangled in the happenings quite by accident. The “attractive gentleman” is likened to a grown-up Christopher Robin by Douglas Green in the Introduction of the Dover edition. He’s quite right, too. Antony is brilliantly smart, an impeccable gentleman and endlessly fascinating while still retaining his child-like awe of life. Antony has a smashing sidekick named Bill Beverly, his “Watson,” if you will. There is a running dialogue between the two of them thinking of themselves as Holmes and Watson. Antony and Bill are thrilled to be involved in the mysterious happenings and their excitement is barely containable when they find clues or new leads. The story is quite a fantasy – the kind of mystery all the lovers of detective stories wish they could find in real life. Lots of strange suspects and plenty of clues but not too much danger for our detecting team. Sadly this is Milne’s only foray into the Mystery genre, even though it garnered him admission into the prestigious Detection Club in 1930. It seems he felt he had perfected his own version of the mystery story with this effort (a sentiment in which I am inclined to agree with him) and had no inclination to continue the characters in their own series. Like all really nice people, you have a weakness for detective stories, and feel that there are not enough of them. So, after all that you have done for me, the least I can do for you is write you one. Here it is: with more gratitude and affection than I can well put down here. Truer words were rarely spoken, I think. I’ve found that fellow detective story aficionados are almost without exception “really nice people.” It’s as though that trait is a barometer of character. Of course there must be many nice people who happen to dislike detective stories, but the ones who do appreciate a good murder usually are rather keen folks. Luckily for us, The Red House Mystery has had numerous re-printings and the paperback copies are available cheap on Amazon and Half.com. If you’re looking for one of the vintage hardcover copies, Ebay has some beauties. I highly recommend it to all those “really nice people” out there. I promise you won’t be disappointed. Pip, pip cheerio friends!